Description: CSXT 486 is northbound with empty hoppers. Description: Westbound empties pass the station at Prince, WV, right smack in the middle of nowhere. The sun would play games on me today. This entire scene was perfectly lit until a cloud darkened the scene as the train approached. Description: other engine from Q302 sitting outside the engine shop waiting to be serviced. 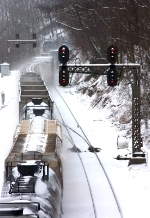 Description: An eastbound train passing the station at Hinton, West Virginia. Description: CSX Q238 rolls uphill at Martin St. Description: Close to sunset we see this CSX Train pass through at a pretty good clip with an ex-CR leading on the ex-CR. Description: Westbound along US 20. Description: Q293 westbound at MP 127. Description: Q293 comes west apporaching MP QB 177. Description: Township Line Rd, at the Belle Mead Co-op, 1448 hours. Description: CSX Q501-20 starting into the Southwest Transfer in Deshler, OH. Description: CSXT 486 and 389 sit at the Eastbound signal at Cotton Hill, WV on the Kanawaha Sub waiting to head up the New River Valley towards Richmond. On the left is the former Passenger Station which now houses MOW crews. This was a very cold / snowy day. Description: CSXT 486 leads a mixed freight through the clasic cantilever C&O signals at Cotton hill switching over from track 1 to track 2. This was a very cold / snowy day.